Oven Roasted Ratatouille – Oil Free! Looking for an easy beautiful flavorful side dish to make? Oven roasted ratatouille is the answer! This has become a regular menu item at our house. First it is easy to make. It’s inexpensive. You can batch cook it. It doesn’t take a lot of time. It’s super versatile. It is beautiful to look at at. Most important of all it tastes amazing and it’s oil free! Choose the vegetables you love the most. 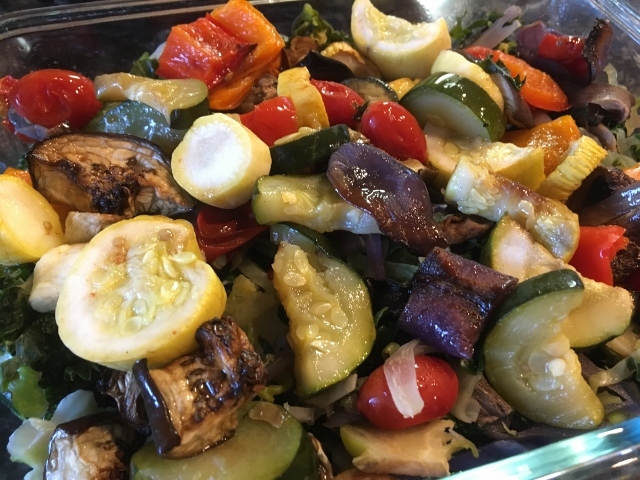 We like zucchini, yellow squash, sweet bell peppers, onion, mushrooms and eggplant. The flavor is delicious the day it’s made but it just keeps getting better as it sits in the fridge. What about seasonings? I like to keep it natural so I have flexibility in the flavor profile depending on how I use it in the coming days. I might want it to be in a Mexican dish one meal, Asian another time or perhaps Italian. Plus it has so much flavor all on it’s own. Hubby Tom says it gets sweeter and more delicious a couple days after it has been cooked. I love it everyday! I learned how to make this from my friend and mentor Chef AJ. We store it in our glass Snapware containers. If you want to make a smaller batch in your Breville Smart Oven Air – use the bake cycle at 425 degrees. The OXO jelly roll pan fits perfectly in the Breville. I use it all the time for baking potatoes and oven roasting winter squash. What did I do before I owned this oven? The full size pan is perfect for larger ovens. 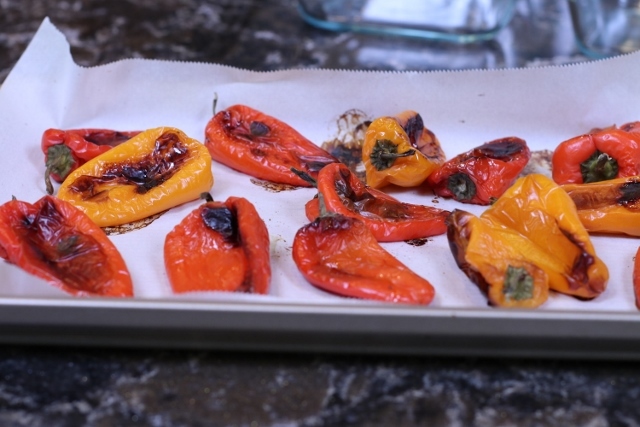 Since I had the oven going and had room a small pan of sweet mini peppers were also roasted. I have a blog post all about Sweet Mini Peppers– check it out. for more information. We made a video to show you just how easy this recipe is to make. I hope you will try it and love it as much as we do. 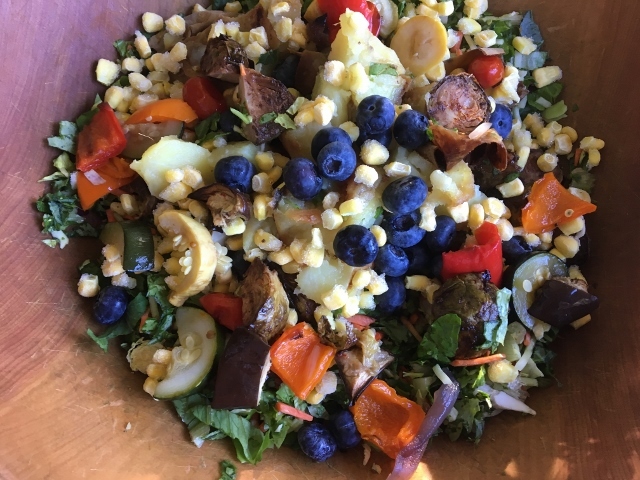 One of my favorite ways to eat ratatouille is to take some and add it to my Big Beautiful Chopped Salad for lunch. It adds beautiful color as well as amazing flavor. Look at how those blueberries popped in natural light! 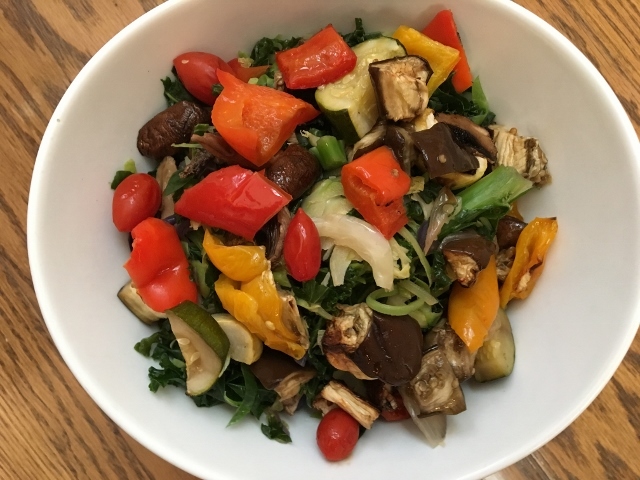 Top off a bowl of steamed greens and brown rice with a hefty portion of Oven Roasted Ratatouille for a very special Nourish Bowl that is bursting with flavor and color. The only sauce or dressing you need is a splash of California Balsamic Flavored Vinegar! This is so delicious with the California Teriyaki Balsamic vinegar. Yummy! Click on this link to see how you can get 2 FREE sample bottles with your order. I don’t have an affiliate relationship with California Balsamic but I do love their products and want to promote their family run California business. This has become one of my favorite ways to eat a Big Beautiful Chopped Salad lately. I add a generous serving of Oven Roasted Ratatouille to my bed of chopped salad ingredients as well as corn and brown rice. I keep the ratatouille, corn and rice in a container separate from the salad until lunch time. Then I heat up those additional ingredients in the microwave before tossing them in my salad. A little Jalapeno powder and ground cumin sprinkled over the salad and mixed in gives it a good Mexican flavor. 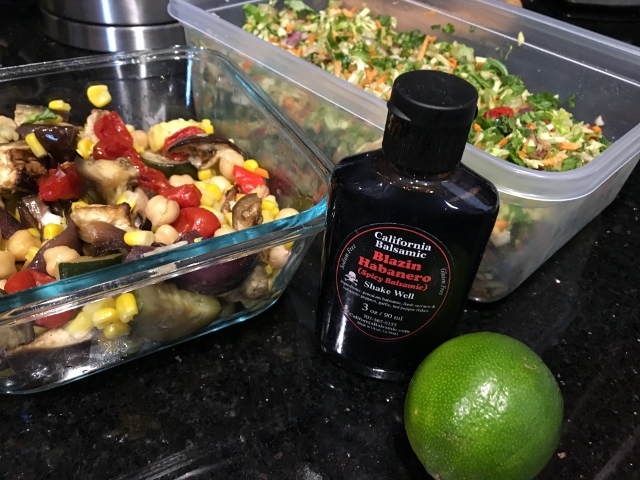 The juice of one lime and some Blazin Habanero balsamic vinegar from California Balsamic is all I need for a dressing. If the Blazin Habanero is too much heat for you, use the Sweet Heat as it has just a tiny touch of heat and plenty of sweet! This is an amazing salad! Use the vegetables you like – you can make as much or as little as you want. Preheat the oven to 425 degrees. Line rimmed baking sheets with parchment paper or silicone baking mats. Wash, rinse and pat dry the vegetables. Cut them into about the same size pieces so they will cook evenly. Roast for 30 – 45 minutes. The time will vary depending on your oven, how full the baking sheets are and the moisture content of the vegetables. When cooked to your desire – remove from oven. 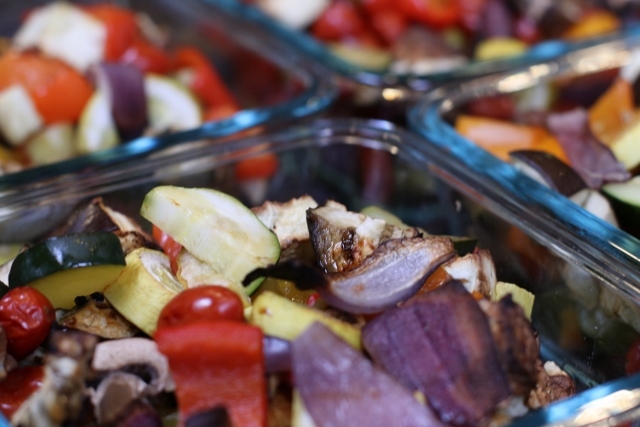 When cool enough to handle, put the roasted vegetables in containers and store in the refrigerator. I like to make my ratatouille without any additional seasoning so I have the freedom to flavor it different ways in the days ahead. I can flavor it Italian, Mexican or Asian and enjoy all the different flavor profiles instead of being locked into one. As we come to a close on 2018 we have much to reflect on in the Nutmeg household. We had quite the year with the amazing premature birth of our twin grandchildren. We are so grateful for their excellent health and of our course our little Sweetpea – their big sister who delights us to no end. We are blessed that we live close enough to see them nearly everyday and to be extra help in daily life in what is a very busy household. The family is thriving and we couldn’t be happier! We are also grateful to you the reader of our blog and subscriber to our Youtube Channel. We appreciate the loyal following we have. We love it when you leave us comments and suggestions for future content. It is our mission to help people transition to a whole food plant based lifestyle and sustain it. It isn’t always easy to be going against the norm and our society surely doesn’t make it easy to eat healthy. It is a learning curve in the beginning but once you figure out how to simplify the cooking it all seems to fall into place. 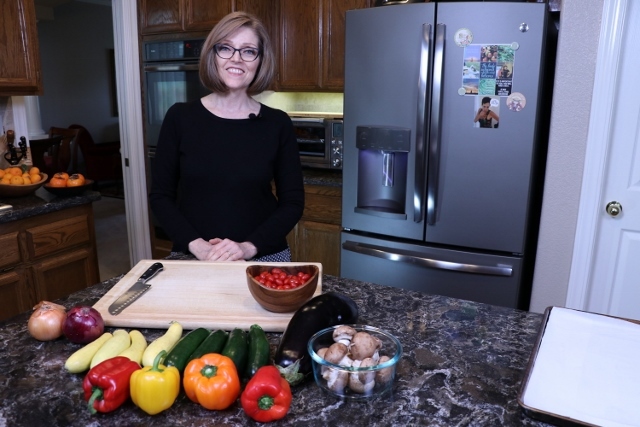 If you don’t the love the food you won’t maintain this lifestyle so we want to show you how to make healthy food that you will love and look forward to eating! We have already started making a list of recipes and videos to make in 2019. We are very excited to share some new content with you. Many of you have made suggestions about the type of things you would like us to cover. We would love to hear from you about what you desire to learn about and we will do our best to accommodate your wishes. Keep those comments, emails and Facebook messages coming! If you live locally and see me out and about I love it when you come up and introduce yourself! We have made so many friends from our social media outlets and getting to meet you in the real world is an added bonus! Wishing you all a Happy Healthy New Year! If you have used our affiliate links to purchase products we want to thank you so much. It is a way to support our work here without any extra cost to you. Thank you for your support. I would like to know how you reheat your food when you batch cook like this? I’m assuming you don’t eat everything cold. I don’t have or use a microwave. Would you steam the Ratatouille to warm it, but then, wouldn’t it get soggy? I love your website and appreciate and enjoy your videos. We do use the microwave oven or the Breville Smart Oven Air either on air fry or on bake to reheat the food we eat. How do you normally heat up leftovers? You can use a pressure cooker to reheat leftovers. If you Google reheating food in a pressure cooker you will find instructions for how to do that. I hope this helps. Batch cooking makes my life so much easier. Happy Cooking! It all sounds wonderful Janet. Enjoy! Happy New Year! Love your ratatouille video. You inspire me and off to the grocery store!. Thank You.